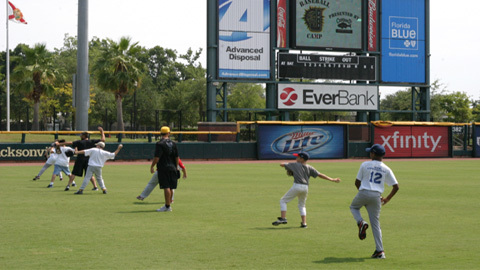 Jacksonville, FL- The Jacksonville Suns are still taking kids for the summer baseball camps being held on June 16 & 17 and June 29 & 30. Ages 7 to 12 are welcome and for just $85 you will receive two days of camp instruction along with a t-shirt, lunc both days and a ticket to a Suns game. The camp will be held on each of these days from 9am to 1pm. Instruction will be given by Suns coaches and Suns players and sign ups for the camps are happening right now! Click on the Baseball Grounds tab on the website and print out the camp form and fax or mail it in. For more information about the camp, contact JD Metrie (jdm@jaxsuns.com),Jarrod Simmons (jarrods@jaxsuns.com)or call 358-2846.